The ME electric motor pumps are ideal for hog, dairy, or beef reception pits, water, sewage, syrup – the list goes on! 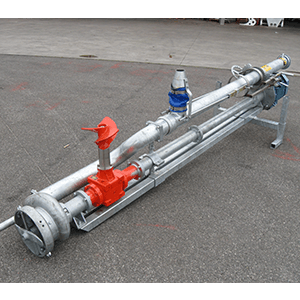 Pumps can be used to agitate, transfer or to fill hauling units. Parts in stock in our USA facility to build pumps in various lengths from 4’-20’, additional lengths available upon request. Pumps can be run with motors from 5hp – 50hp 3phase or single phase. c-face electric motors eliminate belt & pulley problems. Hot dipped galvanize is standard – stainless steel components are available upon request.